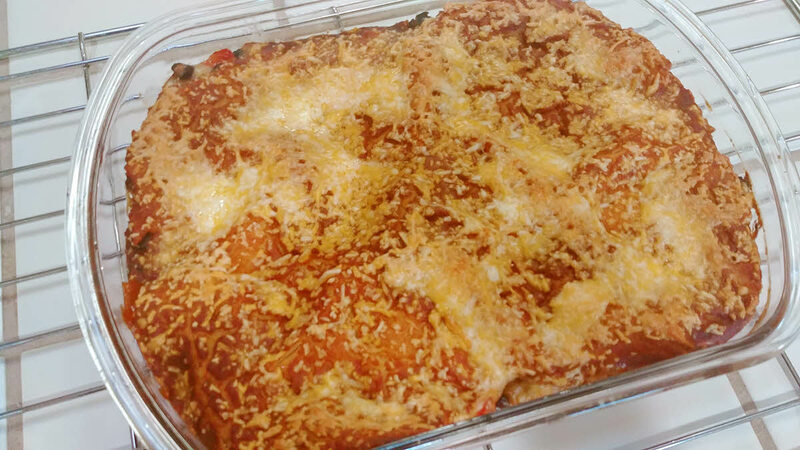 Vegetable Enchilada Casserole is a perfect casserole for any get together. It’s easy to put together, it tastes great, it has a lot of vegetables, lot of protein in the form of beans and cheese and can be assembled before hand. Chop all the vegetables roughly. Drain black beans and wash them under running water. Heat oil in a big pan. Add roughly chopped onions and saute for a couple of minutes. Add cumin powder and red chilli powder and saute until fragrant. Start adding vegetables starting from the hardest and slowly moving on toward the softest so that they all end up at the same level of softness. We need to keep the vegetables a bit crispy. Finally mix black beans and saute until everything is mixed and beans are warm. If you are using corn kernels, those can also be added at this time. Once everything is just heated through, turn off the heat. Now we will assemble the enchilada casserole. Take a 12 inch by 8 inch baking dish and lay a thin layer of enchilada sauce on it. There are many enchilade sauces available in the market, choose any one you like. Now lay tortillas in a single layer without much overlap. If you like, you can also spread a little bit of refried beans on tortilla but it’s optional. Top the tortillas with one fourth of the cheese. Top the vegetables with one third of the vegetables. Pour about one fourth of the sauce all over. Repeat the tortilla, cheese, vegetables and sauce layers 2 more times. Finally place the last layer of tortillas, last portion of sauce and last bit of cheese. Cover it tightly with aluminum foil and at this stage if you wanted to store it away in refrigerator to bake later, you can do that. When you are ready to bake, place it in the middle rack of the oven and bake for about 20 minutes. Then remove the foil and again bake for at least 10 minutes until the top layer starts to brown. Take it out and Vegetable Enchilada Casserole is ready to eat. Leftovers can be frozen for some other time.